[UPDATE Dec 17: Election Results] Nandi Davis [OBA] has defeated Renee Anderson Ming [PLP] and Kim Swan [UBP]. 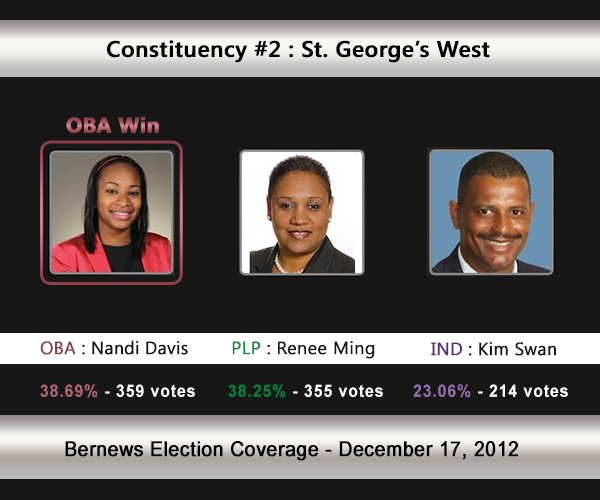 This constituency will see a three-way battle between Nandi Davis [OBA], Renee Anderson Ming [PLP], and Kim Swan [UBP]. The polling station is Tiger Bay Cruise ship Terminal, 17 Penno’s Wharf, St George. Mr Swan is the incumbent, having won 50.95% of the vote vs the PLP’s Dean Foggo [457-440] in the 2007 General Election. In the 2003 General Election, Dean Foggo [PLP] won with 51.27% of the vote against Kim Swan [UBP] who received 48.73%. [Updated Nov 13] Kim Swan will be running as an Independent, not under the UBP’s banner. With the last election having been won by such a tight margin [17 votes] and the added interested of the three-way battle, this constituency is expected to be watched closely by most political observers. 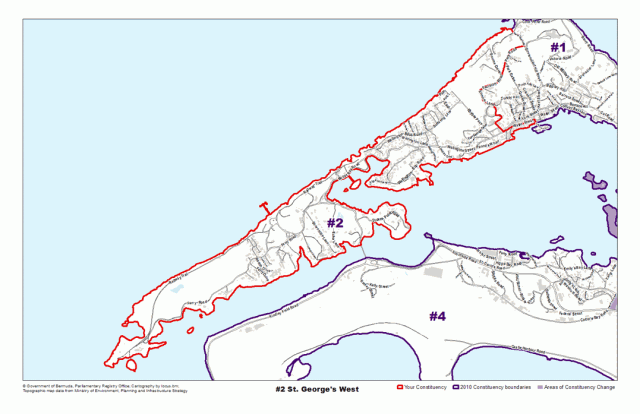 Areas St. George’s West compromises of, or is located by, include Naval Tanks Hill, St. George’s Club, York Street, Water Street, Bartram Island, Roque Island and Little Roque Island areas. Renee Anderson-Ming is a born St. Georgian with strong ties and deep roots in the community. She is the daughter of Lavern Anderson, a long time employee of the Corporation of St. George’s who inspired her daughter to have a deep commitment to community and social activism. She is active in the community and is well-known in St. George’s. Mrs. Ming is a devoted mother and a volunteer on the African Diaspora Heritage Trail and the World Heritage Site Committee. She attends Richard Allen AME Church and has served on the St. George’s Parish Council since 2010. In 2009, she was first elected to the post of Common Councillor for the Corporation of St. George’s and chaired the Activities Committee. In 2011, she was appointed to a special committee to work toward bringing a Marina and Boutique Hotel to the Olde Towne. In 2012, Mrs. Ming was elected to the post of Alderman and currently chairs the Property and Office Administration Committees. She is also a member of the Security Committee, Finance Committee and the St. George’s Preservation Authority. Mrs. Ming is the wife of a Police Officer and is intimately aware of the need for strong and effective policing as well as the importance of a community partnership with the Bermuda Police Service. Renee Anderson-Ming is married to Raoul Ming and is mother to 3 children. Mrs. Ming attended East End Primary School, The Berkeley Institute, The Bermuda College and Howard University. Nandi Davis is part of a rising generation of young Bermudians who see the need for change and want to be involved. She says, “I’m 25 and got into politics because of my concerns about the direction Bermuda is heading. I want to play my part and help. The problems my generation faces are unprecedented, and I don’t believe the current government has solutions for any of them. Nandi was educated at Warwick Academy and Saltus Grammar School in Bermuda, and then went to CompuCollege in Halifax, Nova Scotia. She earned a degree in business and computer applications and a certificate in supervisory management. She graduated with the highest grades for the year in her course. Nandi currently works as an executive assistant to the managing director of AMS Ltd, a fund administration company. Through her work, she has gained firsthand knowledge of international business — having also worked for a hedge fund and interned at Orbis Investment Management. She is currently attending Bermuda College in the evening and working toward an Association of Chartered Certified Accountants (ACCA) designation. Her parents are Deborah and Dwayne Brown. She has a son, Shiia, who is two years old. As an athlete and competitive runner, Nandi has represented Bermuda at a number of events around the world, including the Carifta Games in the Bahamas. She feels more can be done to support our young athletes. Prior to becoming a public officer, Kim Swan had extensive experience working within the public service, serving as the General Manager of a Government Quango for 8 years (1985 through 1992) and managing director of private golf company following several years in the hospitality industry. At age 55, Kim Swan is one of the most experienced members in the House of Assembly, having served as the Member of Parliament for St. George’s West since December 2007, where he held the office of Opposition Leader for three years. Previously Kim served as a Senator for 9 consecutive years from 1998 to 2007, serving 7 years as Opposition Senate Leader under four different Party Leaders. Kim is a professional golfer by trade an Honorary member of the PGA of Bermuda who has represented Bermuda on numerous occasions as a Junior, Amateur and Professional golfer. Kim was the first Bermudian to earn membership on the PGA European Tour and won three Bermuda national titles (The Bermuda Open). He also served as President of the PGA of Bermuda and has been the mentor of numerous Bermudians who went on to become senior executives within the golf industry. Kim Swan received a Bachelor of Science degree from Troy University in 1980 and was recently honoured by the University where he gave the commencement address in 2010. Kim is married to Ercinda “Cindy” Swan, the founder of Project Action charity that provides free transportation for seniors, and they have four children. Mr. Swan is a hard working member of parliament. We see him in the community all year not only when elections are called. We hear him speaking out loudly (sometimes too loud :)in Parliament for St. George and social problems in Bermuda. We read his articles in all forms of media and he didn’t get angry and mean when the OBA deserted him – the stiches in his back are real. Mr. Swan continued to be the honorable man we have come to respect. No Man nor Woman can do a better job than Mr. Swan. If the Whites choose not to support him for his integrity and honest stance what does that say for them. I have spoken with Mr. Swan. He believe that the constitution of the UBP was comprimised and if they the now OBA had followed the constitution as they the UBP cried down Dr. Brown and the Uighurs situation with the large demonstration, that Mr. Pettingill himself stated that he was ashamed to be a white man after the way the whites conducted themselves, Mr. Swan would not have to seek an injunction against the party. The courts agreed that they were wrong! So they just showed us Bermudians that they the OBA alliance does not respect court procedures. How can they respect the Bermuda Constitution if they don’t respect the one that got them elected in 2007 and all the previous years? Eventhough I do not live in St. George’s North, I do know that all the candidates have a love and passion for Bermuda and her people; however, there is one candidate that stands out as a candidate for the people. Their track record speaks for itself and they should be returned to the House – good luck to Mr. Kim Swan as he should win – the best man for the job!